Cautley Spout is considered the highest waterfall in England. This impressive landmark is located within the Yorkshire Dales National Park, known for its many beautiful waterfalls and varied geology. In this protected area can be seen even more than 20 larger and smaller beautiful waterfalls. Cautley Spout itself was formed in the western part of the Yorkshire Dales National Park, located in the northwestern English county of Cumbria. The impressive fa;;s can be found among the mountain hills, known here as the Howgill Fells, formed between the national park and the Lake District. Cautley Spout can be reached by road, with stops in the north of the small English town of Sedbergh. Overall, one of the most fascinating waterfalls in the area of Yorkshire Dales is the waterfall Catrigg Force, which was formed in a sheltered part of the park and astonishes with its harmony and peace. 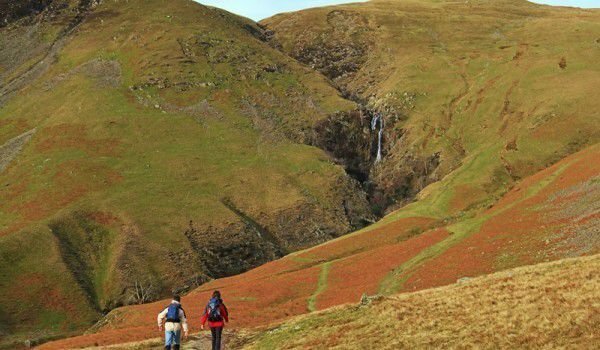 It is considered the “inside” jewel of the protected area, while the impressive Cautley Spout is the "outside" treasure, with an impressive appearance. Cautley Spout drops its waters down the rough rocks through about 200 meters. The waterfall is divided into four separate falls, the highest of which reaches a height of about 76 meters. Cautley Spout descends from the high plateau, named The Calf, goes down the uneven rocky slope and crashes into a dark and inaccessible valley of glacial origin. The highest waterfall in England’s waters drain into the Rawthey river. Downstream along the river have been formed more beautiful waterfalls. Cautley Spout has hiking trails that lead visitors through the beautiful and rich landscapes of Yorkshire Dales National Park. One of the highest peaks here is named Taurus and is 676 meters high.